A new study of methane emissions from livestock in the United States—led by a researcher in Penn State's College of Agricultural Sciences—has challenged previous top-down estimates. "We must have more specific information about methane emissions that combines local livestock populations and characteristics with distribution of landscape features—and a gridded inventory approach provides that," he said. According to the EPA, the top three sources of anthropogenic methane in the United States are the combined energy sector—natural gas, petroleum systems and coal mining—which makes up 40 percent of the total; livestock, 36 percent of the total; and landfills, 18 percent of the total. Compared with enteric methane, predicting methane emissions from manure is a more complex process and carries a larger uncertainty in the estimates, the researchers pointed out. Manure composition, type of storage facilities and manure retention time, and environment—particularly temperature—are among the factors that affect methane emissions from manure. "If methane emissions from livestock in this country really are twice as high as what is estimated now—and we don't believe they are—that would put a big target on agriculture to take measures to cut these emissions," said Hristov. "Having an accurate and spatially explicit assessment of methane emissions from livestock is critical for reconciliation of top-down and bottom-up approaches, and it's the starting point in any mitigation effort." In this analysis we used a spatially explicit, simplified bottom-up approach, based on animal inventories, feed dry matter intake, and feed intake-based emission factors to estimate county-level enteric methane emissions for cattle and manure methane emissions for cattle, swine, and poultry for the contiguous United States. Overall, this analysis yielded total livestock methane emissions (8916 Gg/yr; lower and upper 95% confidence bounds of ±19.3%) for 2012 (last census of agriculture) that are comparable to the current USEPA estimates for 2012 and to estimates from the global gridded Emission Database for Global Atmospheric Research (EDGAR) inventory. 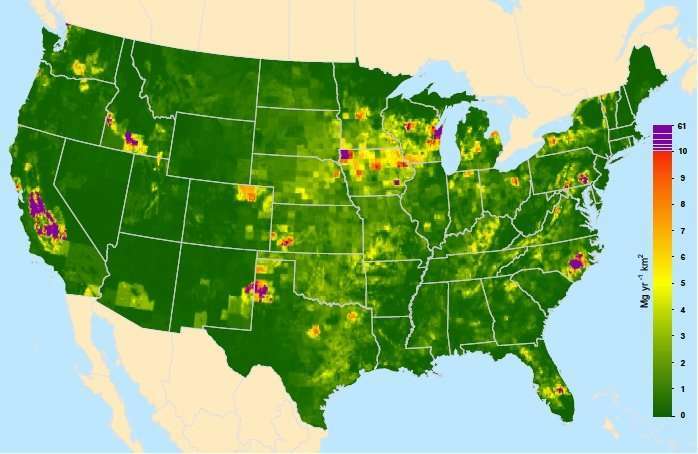 However, the spatial distribution of emissions developed in this analysis differed significantly from that of EDGAR and a recent gridded inventory based on USEPA. Combined enteric and manure methane emissions from livestock in Texas and California (highest contributors to the national total) in this study were 36% lesser and 100% greater, respectively, than estimates by EDGAR. The spatial distribution of emissions in gridded inventories (e.g., EDGAR) likely strongly impacts the conclusions of top-down approaches that use them, especially in the source attribution of resulting (posterior) emissions, and hence conclusions from such studies should be interpreted with caution. You mean to say that government bureaucrats at the behest of congressional toady's for corporate interests have been fiddlin' the books? And suppressing information that would embarrass the politically powerful? I'm shocked! Shocked, I tell you! That anyone would try and pretend that corruption is not endemic to the Age of the Wall Street Casino. The article says that the EPA estimates are close to accurate, but don't have the accurate spatial distribution. And they also say that the EDGAR estimates are higher than this study's estimate.